This probably dates to the 1940s. The address puts it between Wilson and Montrose, about where the Harris Bank is now. 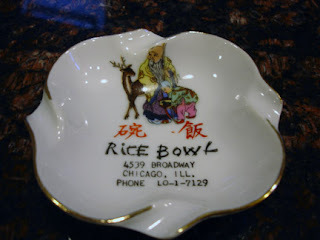 I ate at the good old Rice Bowl many times as a child. Only ordered Chicken Fried Rice and tea. I remember a terrarium at the booth we used to sit at. Also a very nice, tall thin Chinese gentleman was the waiter. Where did you get this and is it for sale? Unfortunately, it's not for sale. I have a small, personal collection of Uptown memorabilia, which I find at estate sales, yard sales, auctions, antique stores, etc. RICE BOWL was a great little place to eat, The teachers from stewart school would eat lunch there also. someone was talking about BISSETS dept. store the other day,I loved that place, always kept up with the fashion of the day. another good mens store was MAJESTICS on broadway and leland right under the tracks, I know its still there. You could go there and get custom fitted for a buck extra,an pickem up next day,try to do that today. Heh heh. I'll definitely keep you in the will.